Exeter BTEC Student In Regional Finals of the Teen Star Competition! Huge well done to Amy Walklett, Exeter first year BTEC student, has reached the Regional finals of the Teen Star Comeptition. See below for offical press release. Amy Walklett from Beaminster has been given the big thumbs up by judges at the TeenStar audition in Southampton. Along with other impressive acts, Amy has made it through to the Regional Finals of the UK’s only singing and dancing competition exclusively for teens and pre-teens, and will now be performing in a live showcase in the competition. TeenStar is an exciting national singing and dancing competition searching for the UK’s best teen and pre-teen singers, singer/songwriters, rappers, dancers and dance groups of all genres and styles. TeenStar is brought to you by Future Music, the company behind the discovery of artists such as Jacob Banks, Warner Music’s Birdy and Union J’s Jaymi Hensley. For the first time, ever, the competition has now opened its doors to dancers too! With even more talent entering the competition, the TeenStar competition is an exciting opportunity for teens and pre-teens across the UK. One contestant who has evidently caught the judge’s eye is local talent Amy Walklett, who is now in the running to follow in the footsteps of previous winners Luke Friend and Emily Middlemas, and compete for a place in the Grand Final. Thousands of hopefuls entered TeenStar nationwide and hundreds of auditionees queued patiently on the day for their turn to impress the judges. Those who made it through the audition stage will now take part in a live Regional head-to-head battle alongside the best talent in their area. They’ll be performing in front of hundreds of audience members and a professional judging panel to win a place at the National Grand Final. The competition is divided into age categories – ‘Late Teens’ (16-19), ‘Mid Teens’ (13-15) and a special category searching for the stars of tomorrow, the Pre-Teens! All types of singers and dancers are invited to enter TeenStar. All entrants are aiming to make it to that prestigious Grand Final where the spotlight will be shone on them and they’ll have the chance win some huge prizes such as; recording an album, shooting a music video, scholarships to the Flawless Dance School, sponsorship from Squad Dancewear and more. 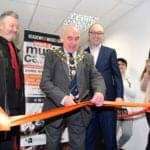 The latter stages of the competition will also provide acts with the opportunity to impress many guests from record labels, agencies and the entertainment industry as well as judges from BBC Introducing, national radio and regional press. Past judges for Future Music competitions include Radio 1’s Annie Nightingale MBE, KISS FM’s Charlie Hedges and four time Ivor Novello award winner Mark Hill, also known as one half of the Artful Dodger, plus A&R reps from Sony, Warner and Syco Entertainment. Birdy’s career has gone from strength-to-strength since winning a Future Music Competition in 2008, after securing a deal with Warner Music and watching her debut album achieve Gold status in the UK and platinum status throughout Europe, and receiving a 2014 BRIT award nomination. Hopefully the TeenStar 2017 winner can go on to gain a similar success. If you’d like to hear more from Amy and follow her progress in the competition you can visit her Facebook page @amywalklettmusician or her twitter @amywalklett; and to watch her latest covers, look for her on YouTube! For more information go to the website www.teenstarcompetition.co.uk! You can purchase tickets from the website www.teenstarcompetition.co.uk, as well as on the door subject to availability or from Amy Walklett.